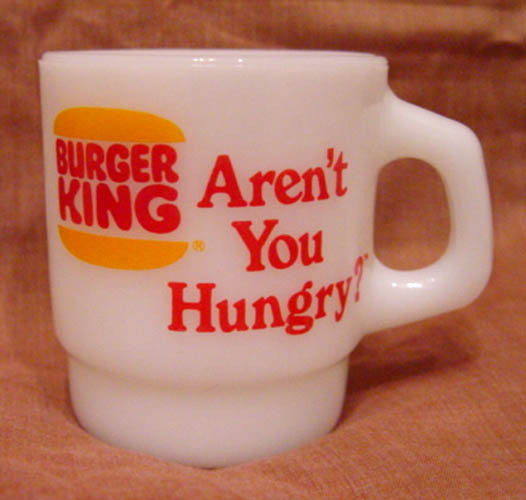 For several years up until 1986 Burger King’s main advertising slogan was “Aren’t You Hungry?” The mug in the picture is said to be from the 1970s – and if you happen to have such a mug you’ll be happy to know that it is now a collector’s item and is reportedly worth $102. For most of us, hunger is only a temporary discomfort which can be quickly remedied by stopping by Burger King or any of the numerous restaurants competing for our business. But not everyone has the means to buy a Whopper, Big Mac, or whatever – although, sadly, many financially challenged people spend too much of what little money do they have on fattening fast-food items rather than on more nutritional food. As we all know, there are multitudes of people around the world and in our own country for whom hunger is a chronic problem, not just a temporary discomfort. But, as most of you have heard, the government’s provision of funds for SNAP is facing the possibility of decisive cuts. Last week in a highly partisan vote, the U.S. House of Representatives passed the Farm Bill without any provision for food stamps. Hunger assistance has been part of the Farm Bill since the 1960s, mainly for political reasons. And now, also mainly for political reasons, funding for SNAP has been separated from the Farm Bill by the House. That doesn’t mean that there will no longer be any food stamps. The Senate will most likely not pass the House bill, and the President would most probably veto it if they did. And the House will doubtlessly pass a bill making some funds available for SNAP, although far less than is in the current budget. Most fiscal conservatives declare that there are far too many people getting food stamps. And there are a very large number of recipients. But the problem is not that so many are getting government assistance. The problem is that there are so many people living below the poverty line, or at least beneath 130% of that line. In April of this year there were 47.5+ million people on SNAP, which was down slightly from March but up from the 46.2+ million in April 2012. And note this: 47% of the recipients are children below the age of 18. The financial situation in the corporate world, though, is quite good now. Last Friday both the Dow and S&P 500 closed at all-time highs. Those of us with investments in stocks and bonds are quite happy with our portfolios at this time. But those who live below 130% of the poverty line do not have investments. A record number now do have assistance from the government in order to buy food. But if the Tea Party Republicans and those who agree with them have their way, there will soon be considerably less money available for SNAP. As a result, there will be a growing number of people, including many children, who, hearing the question, “Aren’t you hungry?” will have to answer “Yes” when they go to bed – night after night after night. This entry was posted in Regular Post and tagged Farm Bill, hunger, SNAP. Bookmark the permalink. 1 Response to Aren’t You Hungry? “Thanks for bringing this very important conversation related to local hunger to the public debate. I volunteer every Tuesday in the Kearney Food Pantry hoping that my small efforts can make a small difference in this huge problem. “I was very pleased to see that the editorial on Sunday, July 14, in the Kansas City Star strongly chastised our local Republican politicians who cut SNAP out of the agriculture bill. These 4 Republicans voted a nice welfare package to area farmers but at this point have done nothing for the hungry in our community.